With a lifelong love of fishing, Captain Al Anderson was tagging fish using copper wire while a graduate student at Adelphi University. In 1967 he tagged his first striped bass for the American Littoral Society and began tagging bluefin tuna for Frank Mather, founder of the tagging program at Woods Hole Oceanographic Institution in Massachusetts. 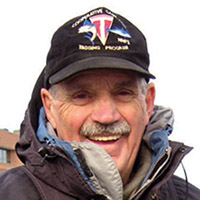 While charter fishing part-time aboard the Prowler out of Wakefield, Rhode Island in 1977, Anderson worked with Jack Casey’s shark tagging program and other agencies. After a 20-year teaching career, Anderson became a full-time charter captain. He has always credited his clients for his considerable successes, achievements, and contributions to marine science. He has shared his vast knowledge in books, magazines and journals, and in 2011 was one of five recipients of Sport Fishing magazine’s Making a Difference Award. Anderson has been dedicated to fish tagging for the past 50 years -- not only tuna and striped bass, but marlin, sharks and bottom fish. According to the National Marine Fisheries Service, Anderson has tagged more Atlantic bluefin -- and has more recaptures -- than anyone in the world. In August 2014, he tagged and released his 60,000th game fish-- a six-pound striped bass.